Branson Cafe was established in 1910, so we’ve been around longer than Branson has been a town. That makes us Branson’s oldest restaurant! We’ve been featured on the 60 Minutes presentation of Branson, Fox News channel’s “Across America”, and Tom’s homemade pies have been featured on the Today show! 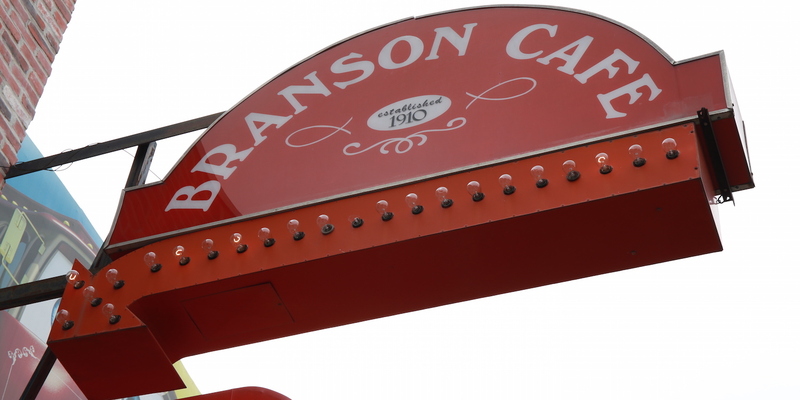 The Branson Cafe has operated in its current location since the late 1920s. The historic Branson Cafe building has been owned by the Fausett family since 1943. Raymond Fausett purchased the building and his brothers Everette and Leon operated the restaurant until the 1950s. In 1953 Eddie and Georgeann Fausett began to operate the restaurant. In 1960 the Fausett’s handed over the operation of the restaurant to Glenn and Inez Henderson who ran it until 1975 when Mike and Marge Anderson took over. In 1985 Ken Roten began to run the operation and ran it until 2005. Today, Tom and Susie Roten are happy to continue the tradition of serving good food in historic downtown Branson. Combined with fresh breads, desserts and pastries from Tom’s Town Bakery, this is a place you’ll want to stop!